Have you ever made anything with blood oranges? They make anything look amazing! This isn’t a weekly Kitchen Adventure, but rather a bonus recipe made with an unusual looking (but not unusual) fruit: blood oranges. I received several of these oranges, named for their striking color, from a friend’s tree. Don’t you love getting free, homegrown food? 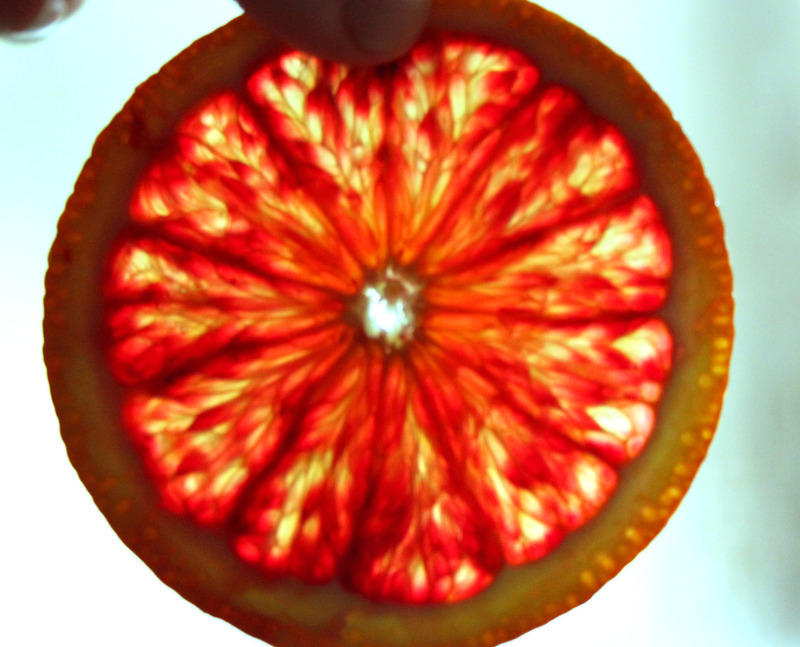 A beautiful thin slice of blood orange – doesn’t it look like a kaleidoscope? with them. I sliced one orange thinly and candied the slices. 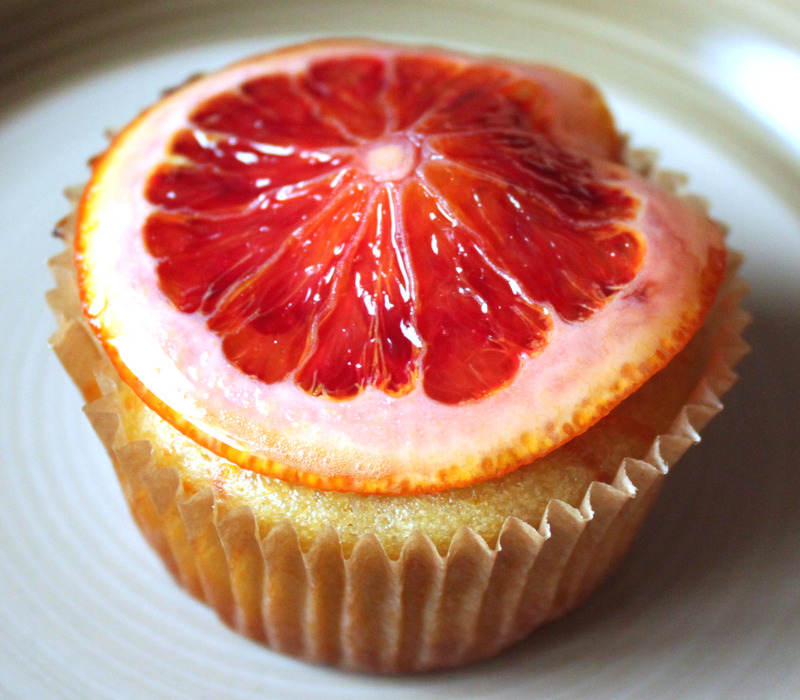 With the rest, I adapted a blood orange olive oil cake recipe into some muffins/cupcakes (they really walk the line between these two – sweet but not frosted. Maybe muffincakes?). 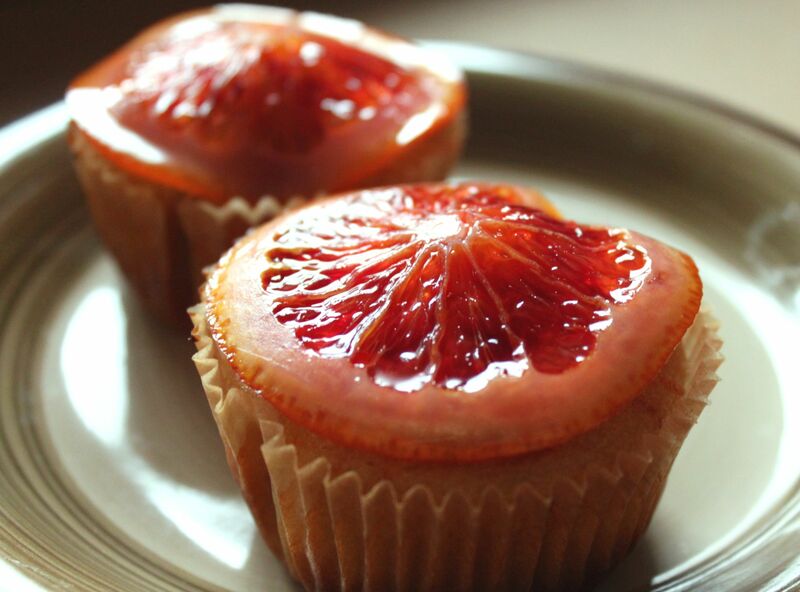 Topping the muffins with a slice of candied blood orange gives them a delightful sweetness and gorgeous color that make them quite a treat. Preheat oven to 350°. Grease or line a muffin pan with paper cups. Zest 2 of the oranges and whisk the zest with the sugar. In another bowl, juice 1 orange and add yogurt until you have 2/3 C total (I had about 1/3 C of juice). Add the juice and yogurt to the bowl of sugar and zest, whisking together. Then whisk the eggs into the mixture. Combine flour, baking powder, baking soda, and salt. Slowly add the dry ingredients to the wet, whisking out lumps as you go. Slowly mix in the olive oil. Supreme the remaining 2 oranges; slice off the skin, pith and membranes. It’s easiest to cut off both ends, so the orange will sit flat on your cutting board, and slice off the skin and pith, following the curves of the fruit. Then, following the lines of the membranes, slice the fruit and place it in a bowl. Break it up the slices into smaller pieces and add to the batter. Fill muffin tin cups about 3/4 full with batter. Cook 12-15 minutes or until a toothpick inserted in the middle of a muffin comes out clean. Let the muffins cool, then top with a candied orange slice before serving. Note: you can make this ahead of time, or even skip this if you want to make simple muffins. The slices are delicious and beautiful though, so if you have extra oranges, give it a try! Slice the blood orange as thinly as you can manage. Bring water and sugar to a simmer in a saucepan, stirring until the sugar is dissolved. 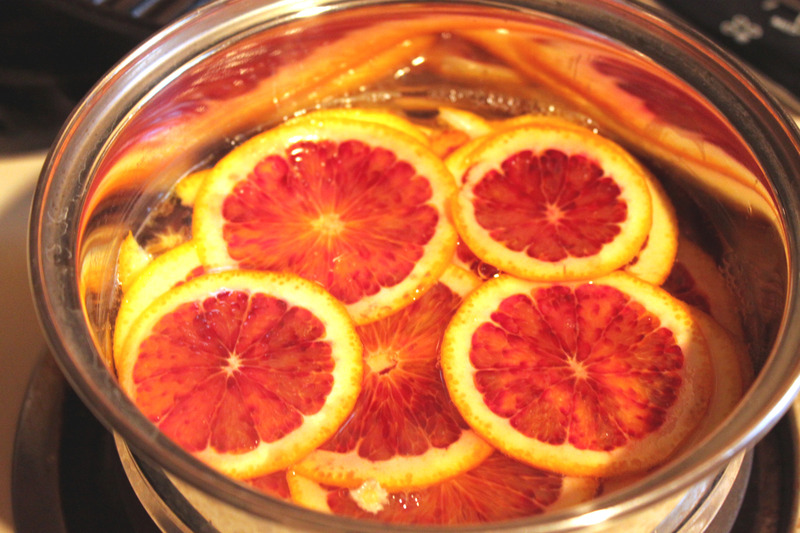 Add blood orange slices and keep on a low simmer, turning them over after 30 minutes. Simmer for a total of 45-60 minutes, or until the peel on the slices starts to become translucent. If you want to make candy more oranges, simply increase the amount of water and sugar (such as 1 1/2 C of each for 3-4 oranges). This will keep in the fridge for a long time. You can use the syrup to sweeten beverages or anything else you want (blood orange margaritas anyone?). when do you add the eggs? Oops! Thank you for pointing out my mistake. I updated the recipe – you add them to the mixture of sugar, zest, yogurt and juice. Thanks George! 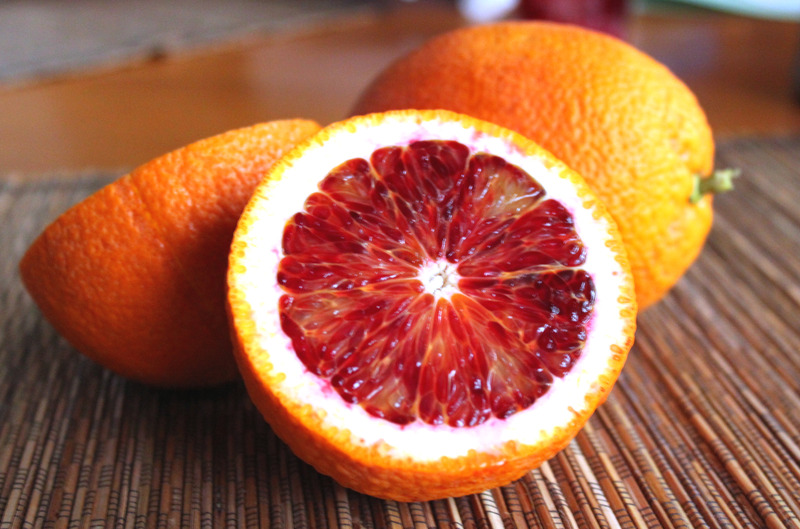 I love blood oranges!! the best juice I ever had was in Pompeii at a little road side stand where the squeezed the juice by hand…..wow…brings back memories…sigh…. Fresh squeezed blood orange juice sounds lovely! I hope you can find some blood oranges – if not, regular ones would work too, just not look as pretty.